Ardmore, with its smooth beach, its colour-washed cottages and green fields is the pleasantest of places. It was once an Episcopal see which for centuries ranked high among the high places of Ireland. For it is said to have been founded by St. Declan who travelled to Rome and returned to Ireland, landing at Ardmore in the year 402, to teach his countrymen the true faith, prior even to the coming of St Patrick. In one night Declan is supposed to have built the famous Round Tower – the most perfect of its kind in Ireland – and the nearby church of which the ruins remain. Declan’s patron-day, the 24th July, was for a long time the occasion of a considerable pilgrimage to Ardmore, and his Oratory, a rude hut, is still standing. The Round Tower originally used as a belfry and refuge, differs from other Irish towers in that it is divided by 4 beltings, or string courses, into as many stories, with a window opening to each. It is built of cut stone, is 19.7ft high, with a diameter at the base of 15ft; the round headed entrance door is 13ft from the ground. The conical cap still stands, but the crutch-like cross which once surmounted it was long ago destroyed by soldiers who used it as a mark for musket-shots. In 1841, excavations in the base of the Tower revealed the remains of 2 skeletons laid in a bed of shifted earth. Above this was a floor of concrete, over which where 4 successive layers of large stones, closely fitted, and overlaid in turn by a floor of smooth concrete. 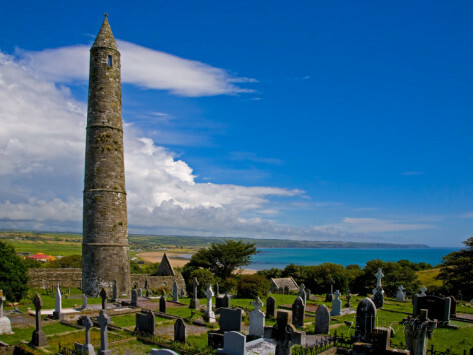 Ardmore Round Tower is a must see attraction on your Ireland tours.